Just About Greener Living is about living how to incorporate better ways to live a healthier and simpler lifestyle whether you're just starting to realize the importance of saving the planet or you've been living an eco friendly lifestyle for years, you can always learn something new. 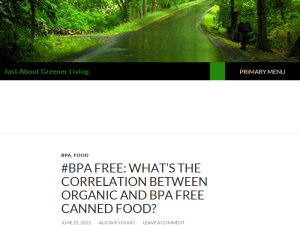 Also, a blog to find BPA free products and dangers of BPA plastics. This what your Just About Greener Living Blog Ad will look like to visitors! Of course you will want to use keywords and ad targeting to get the most out of your ad campaign! So purchase an ad space today before there all gone! If you are the owner of Just About Greener Living, or someone who enjoys this blog why not upgrade it to a Featured Listing or Permanent Listing?